The first fire broke out in a pine forest near the seaside settlement of Kineta, 30 miles west of Athens. Former Greek prime minister Lucas Papademos has been wounded in a suspected bomb attack in the capital Athens. Greek police said an explosion in his car in the city centre, which also wounded two others, has left the politician with non-life-threatening injuries. Greek media reported Mr Papademos suffered injuries to his hands and legs after opening a parcel that turned out to be a letter bomb while being driven in his car. His driver was also injured in the blast that occurred at 6.30pm local time, Athens newspaper Kathimerini claimed. Police are yet to confirm whether the explosion was caused by a parcel bomb. Mr Papademos served as prime minister for six months in 2011-2012 and is a former deputy governor of the European Central Bank. Rio 2016 is in full swing, but what do these eerie photos show happens when the Olympic party leaves town? Greek leftist leader Alexis Tsipras told thousands of people gathered in Athens last night that an end to "national humiliation" was near. 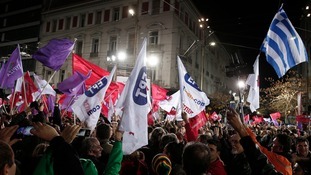 Recent opinion polls showed his Syriza party pulling ahead three days before an election. Tsipras urged Greeks to give Syriza an outright victory in Sunday's vote so the country could turn its back on four years of austerity under the terms of an EU/IMF bailout. "On Monday, national humiliation will be over. We will finish with orders from abroad," Tsipras, 40, told flag-waving supporters at his biggest election rally. Hundreds of Greeks gathered outside the Acropolis museum on Sunday to hold a candlelight vigil asking Britain for the return of the Elgin marbles. The marble statues from the facade of the Parthenon have been the subject of acrimonious dispute since they were taken from Ottoman-ruled Athens by the Earl of Elgin in 1816. The British Museum attracted controversy last month when it agreed to loan part of the marbles to a museum in Russia. The new year has begun in the Greek capital Athens where a lone firework is seen in front of the Parthenon on Acropolic hill. A Syrian government delegation heading to peace talks in Switzerland was held up for hours in Athens after a Greek firm refused to refuel the plane they were travelling in. Vassilis Alevizopoulos, head of Greece's Civil Aviation Workers Union, said a fuel firm had refused to refuel it because of European Union sanctions against Syria. Syrian state television issued a terse statement saying the four-hour delay could cause foreign minister Walid al-Moualem to miss his meeting with UN chief Ban Ki-Moon. It said the plane had later resumed its flight. Greek police have asked for permission to check the phone records of Golden Dawn politicians as part of an investigation into the killing of a anti-racism rapper by a supporter of the far-right party, police said. The headquarters of the far right party, Golden Dawn, in Athens. The government has already asked judges to investigate links between the party, which won 7% of the vote in the last election, and the death of Pavlos Fissas, who was stabbed to death on Tuesday night, after being ambushed a crowd of 30. A police officer told Reuters that they want to establish if Golden Dawn politicians or local party chiefs called supporters on the evening of the death. The government says it believed the party is a criminal organisation and a threat to public safety. Greek Prime Minister Antonis Samaras has called for calm during an "extremely critical time" for the country after an anti-fascist rapper was fatally stabbed by a man allegedly linked to far-right party Golden Dawn. Samaras said in a televised address to the nation: "This government is determined to not allow descendents of Nazis to poison society, to commit crimes, to terrorise and to undermine the foundations of a country that gave birth to democracy." Golden Dawn, Greece's third most popular party, insisted it had nothing to do with the killing and has condemned the attack. Those who accused the party were "wretched sycophants" trying to win votes, the far-right party added.